A controversial offside call in stoppage time robbed Edinburgh City of a point in their 2-1 defeat at Annan. 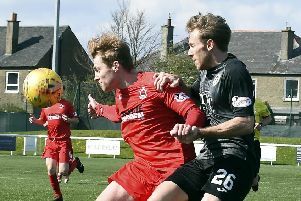 Ross Ferguson’s early strike was canceled out out by Farid El Alagui, only for Jack Brannan to hit what proved to be the winner midway through the second half. El Alagui looked to have rescued a point in stoppage time when he hooked home from close range following a scramble, only for the assistant’s flag to cut the celebrations short. City’s vociferous protests that it should’ve stood were based on Annan having two players on the goal-line. There were other decisions that irked boss James McDonaugh, who chose his words carefully afterwards. “The decisions that went against us – I don’t know if you can get in trouble at this level for what you say so I better watch,” he said. “We’ve had a ball cleared off the line that our players claim was in – that isn’t given. We’ve had a penalty claim – it’s hard to say it’s a 100 per cent stonewaller, but it’s 90 plus per cent. Then we equalise in the last minute and the linesman gives offside. Home goalkeeper Alex Mitchell was called in to action after five minutes when he had to adjust in order to prevent a deflected Ashley Grimes strike from sneaking in at his near post. At the other end, Craig Thomson was in the right place at the right time to kick Steven Swinglehurst’s goal-bound header off the line from a corner with Calum Antell beaten. Annan then opened the scoring just over ten minutes in. Blair Henderson lofted the ball in behind for Ferguson, who smartly lobbed Antell from the angle for his first Annan goal. There were strong City claims for a penalty after 20 minutes when Scott Shepherd showed good strength to muscle his way between defenders. He appeared to be caught after cutting the ball back, but referee David Lowe said no foul. They thought they’d levelled when El Alagui met Liam Henderson’s corner with a glancing header and the French-Algerian was off celebrating, only to see it headed off the line. He and Henderson were adamant it had gone over, but again the appeals fell on deaf ears. There was no doubt when the equaliser arrived soon after. Another good delivery from Thomson found El Alagui, and he sent a thumping acrobatic volley back across Mitchell in to the bottom corner. A scrappier second half was settled when Brannan’s drive from the edge of the area found its way past Antell. Mitchell’s fine stop from a Craig Beattie header prevented a late equaliser before the assistant’s flag did likewise after the scramble and ‘goal’ that followed. While disappointed at the second period, McDonaugh was pleased with the first-half display. “I think we played well in the first half,” he assessed. “I think we looked like a proper football team. We passed the ball well, we had a good structure to our team and we looked good actually. I would go as far to say we looked beyond our position. Annan Athletic: Mitchell, Brannan, Creaney, Moxon, Hooper, Swinglehurst, Orsi (Luke 75), Omar, Smith, B Henderson, Ferguson (Watson 87). Edinburgh City: Antell, Caddow, Walker, Laird, Thomson, Grimes (Beattie 76), L Henderson, El Alagui, Shepherd (Hall 79), Morrison, Allan (Malin 70).